The Hornby Magazine Yearbook is with us once again, published on 1 November by Iain Allan, just ready for Christmas. 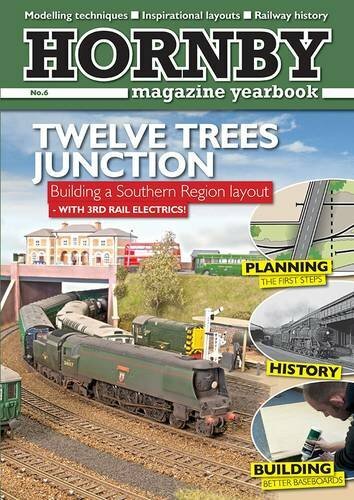 Editor Mike Wild has set Hornby Magazine Yearbook No 6 around the Southern Region and a completely new model railway layout featuring 3rd rail electrification. Twelve Trees Junction is set in the transition period, and features the final days of Southern Region steam, complete with Q1 and Spam Can pacifics alongside early electric multiple units and class 33 diesels.Like last year’s Topley Dale, the yearbook takes the relative beginner through all the key stages of designing and building a model railway and covers historical research, the basics of planning, and building baseboards in a reasonable degree of detail. The Hornby Magazine Yearbook is effectively a thirteenth issue of the magazine, it is presented in casebound format as a standalone book, rather than as a magazine or bookazine as produced by competitors. Its content is broadly in line with the magazine, and there is some continuity with certain key projects, but what makes the publication stand out from all of the others is that it is a self-contained guide to building a model railway from scratch. The mix of features show the reader how to build the baseboards, how to lay track and set up the electrics, make the scenery and buildings and what locomotives and rolling stock to operate on the finished layout.